Learn how to fold an easy origami fish! This traditional model uses one sheet of origami paper and takes just a couple of minutes! Great for kids. Here is a very simple Japanese origami model, the traditional origami fish! You could make a very pretty display out of these origami fish, use them as chopstick holders or stick them onto handmade greetings cards. This origami model makes a perfect starting model for adults or a progression from a super easy model like the traditional origami boat model for kids. For this model all you will need is one sheet of square origami paper, you could use one coloured paper, duel toned or patterned paper. Get some free printable origami paper from Paper Crystal. How to make an Origami Sail Boat! How to make an easy Origami Swan! First of all, have your paper white side up if your paper has one. Now fold the paper in half diagonally and then unfold it again. Fold the top and bottom corners to the middle crease as shown. Fold the right point over to the left point. Fold the top and bottom corners into the middle crease. Pull the bottom flap out to the right and flatten. Repeat this on the top flap. Bring the layer to the right from behind. Flip the model over, left to right. Fold the right corner to the central point. Flip the model back over to the other side. Fold the top half over and behind. 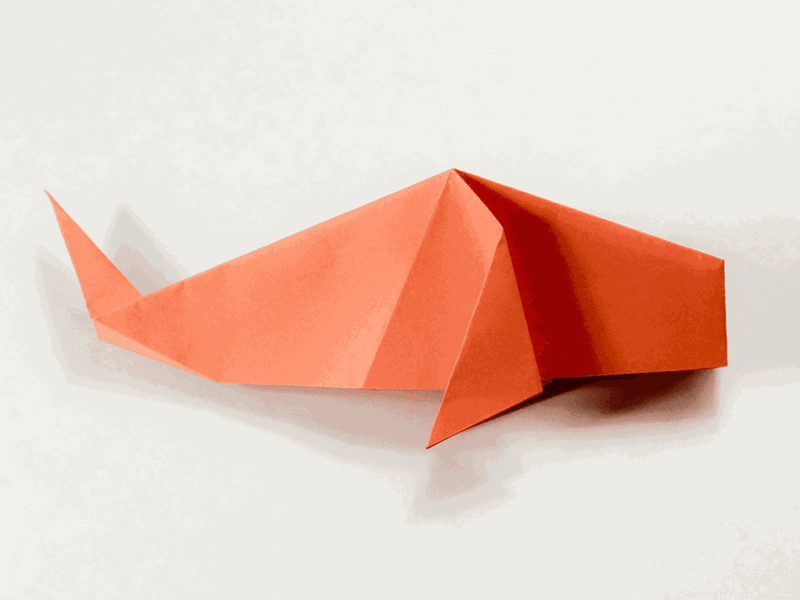 Fold the fin backwards and repeat on the other side. Fold the tail upwards and then unfold. Reverse fold the tail and flatten the model. You should now have a cute little origami fish! You can adjust the angle of the fins and tail for different looks. Remember it can take a few goes to get an origami model right, so don't worry if yours isn't perfect. Start from the beginning but this time make the creases a little more precise! For some more origami fishes, check out this cute origami fish tutorial and this traditional origami fish tutorial.